Bike Tour :- Two nights minimum of stay Choices :- Half day, one day. We'll start riding to escape into the Thai country side back roads which parallels the Chao Phraya River. The ride continues through to the villages and the paddy rice field until the trail meets the river ferry. After crossing the river ferry, we will visit the grandiose King's Summer Palace (Bangpa-in Palace). Afterward, we will ride back to Ayutthaya Garden River Home. 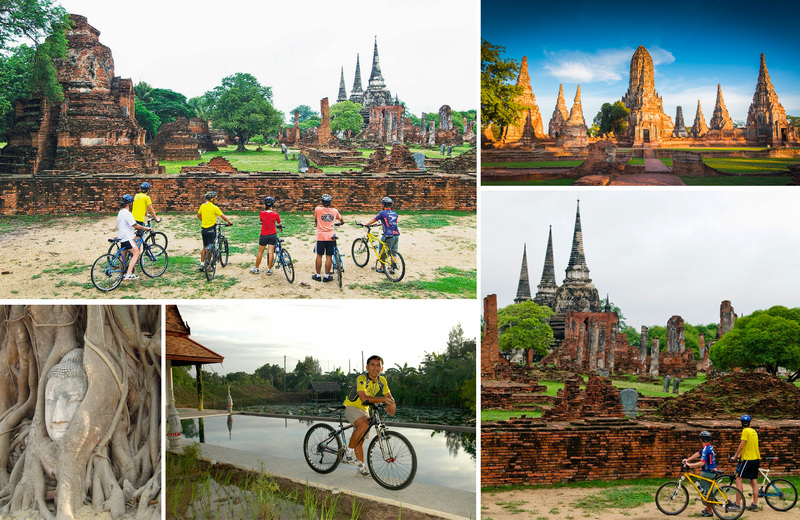 Continuing from the half-day, the whole afternoon will be spent riding the impressive Ayutthaya World Heritage Historical Park. Wat Chaiwathanaram, the favorite temple of our present Queen. The picturesque three roots that ensnare its imbedded Buddha relic at Mahathat Temple, then we ride back. Garden River Home Any time not after 01.30 pm. 07.30 - 08.30 am. Drop off Around 05.30 pm.. Around 05.30 pm. Total distance 10 km.-20 km. (Depending on the guests) 30 km. Mountain bike, helmet, English speaking guide, bus with driver (for one day tour), lunch, snacks, drinking water, cold towels, entrances fee, ferry, our boat tour and our massage.